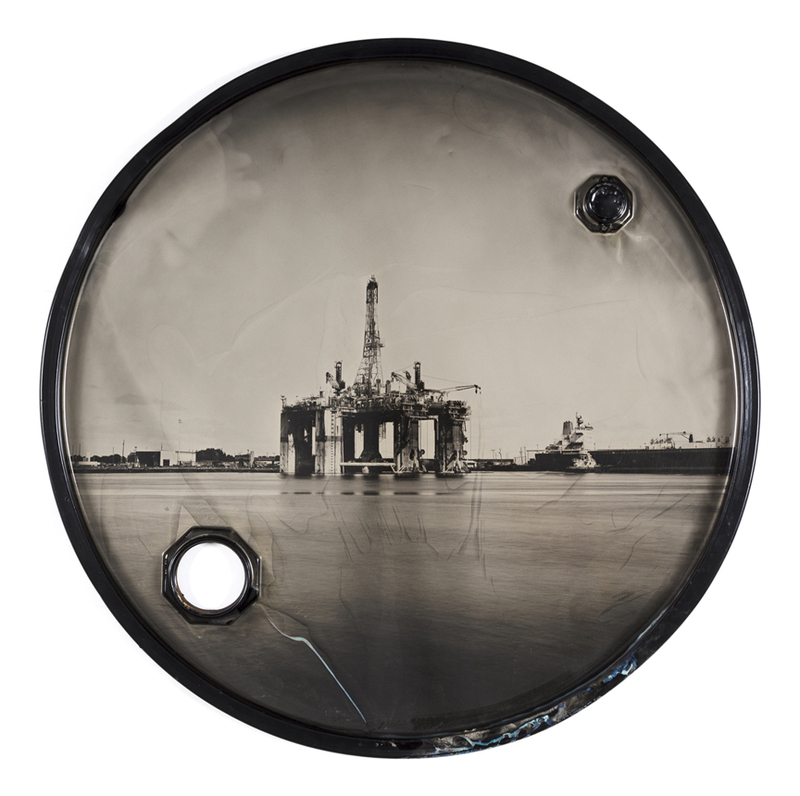 For the series POWER, Adams travelled cross-country and created images directly on 55-gallon oil drum lids using the wet plate collodion process. He hand-built an ultra large-format camera and used a mobile darkroom so that the photographs could be developed on site. David Emitt Adams is an artist whose current practice engages historical media in order to create an informed contemporary dialogue about photography's past and present. Born in Yuma, Arizona, David obtained is Bachelors of Fine Art from Bowling Green State University in 2002 and Masters of Fine Arts from Arizona State University in 2012. He is the recipient of numerous award, including the Photographic Education's Crystal Apple Award (for excellence in experimental b&w photography), the Magenta Foundation's Emerging Photographers Award, and the Nathan Cummings Travel Award. David is a board member of INFOCUS, the Phoenix Art Museum's photography association. Adams's work is exhibited nationally and internationally, and is in the permanent collection of The Museum of Photographic Arts in San Diego, the Santa Barbara Museum of Art, The Center for Creative Photography in Tucson, as well as numerous private collections. David has presented lectures on his work at the San Francisco Art Institute, the Carnegie Museum of Art, the Medium Festival of Photography in San Diego, and the 50th Anniversary Society of Photographic Education Conference in Chicago. The Etherton Gallery in Tucson, Arizona and the Photo-Eye Gallery in Santa Fe, New Mexico represent David's work. Standing out prominently among the 104 submissions this year for the CJL Award competition--and something that attracted me--was the matter of process. How the artist manifested and exhibited her or his desired image took shape through approaches that were conventional and not so conventional means, photography and otherwise (i.e., new, not so new, and constructed technologies). The litmus for the finalists and the winner was, in part, ingenuity, imagination, skill with their selected tools, and grit. These were common characteristics among the ten finalists. Additionally, some of the finalists also exhibited what we at the 21 Editions/Od Review look for, in part, which is something unique, provocative or new...something we may or may not have seen before, but shown to us in a new and exciting way. This work, we believe, will ultimately contribute to the evolving history of photography.